FeastHome – There are a lot of kitchen elements which are important, one of them is a faucet. Many people are not really concerned about this one kitchen element. 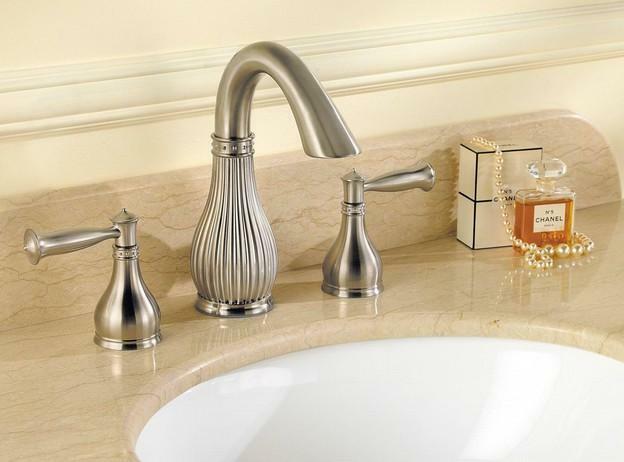 In fact, even though a faucet is a small kitchen element, it is able to add style to the kitchen area. Check these ideas of kitchen faucet below in order to make your kitchen looks more stylish. This stainless steel kitchen faucet is very unique and decorative. 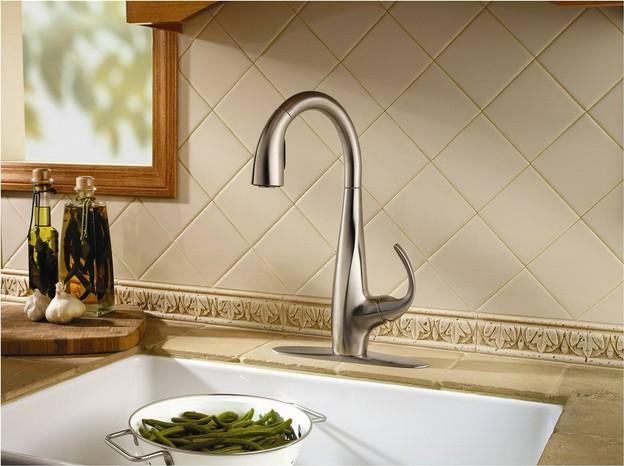 The decoration of the kitchen faucet is able to make the stainless steel sink looks less boring. Moreover, it matches perfectly with the stainless steel sink and the stainless steel countertop. The stainless steel elements blend very well with the white color that dominates the area, creating a minimalist look there. For you who want to instantly make your sink looks more attractive, you are able to pick this type of kitchen faucet. Having a bronze kitchen faucet is a great idea to make your sink looks fancy, just like the shiny bronze kitchen faucet in the image above. The bronze color is also able to bring a warm atmosphere to the area, just like a wood material. There are 2 bronze kitchen faucets in this kitchen, the big one might be used for washing the dirty dishes, while the smaller one might be used for washing hands. And if you can see in details, the bronze kitchen faucet matches with the bronze handle of the kitchen cabinets. 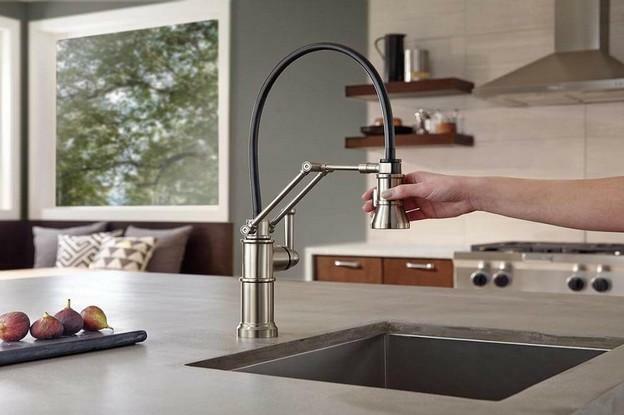 If you require a modern kitchen faucet, this one might be suitable for you. The design and shape of this kitchen faucet look very simple and modern at the same time. Moreover, the shiny stainless steel material accentuates the modern look. The kitchen faucet blends perfectly with the marble countertop and even with the white brick kitchen wall that has a simple traditional style. Place a flower pot near the sink to sweeten the area, just like you can see in the image above. The black kitchen faucet completes the classy traditional look in this kitchen area. The black color from the kitchen faucet makes it look super stylish. Moreover, it matches perfectly with the black marble countertop and wooden kitchen cabinets. It even blends well with the white windows. Some flower pots are placed in order to make the area looks sweeter and nicer. 2 faucet handles might be used to control the water flow. The kitchen faucet in the picture above looks very simply artsy because of the design. There are 2 handles that might be used to control the flow of the water. 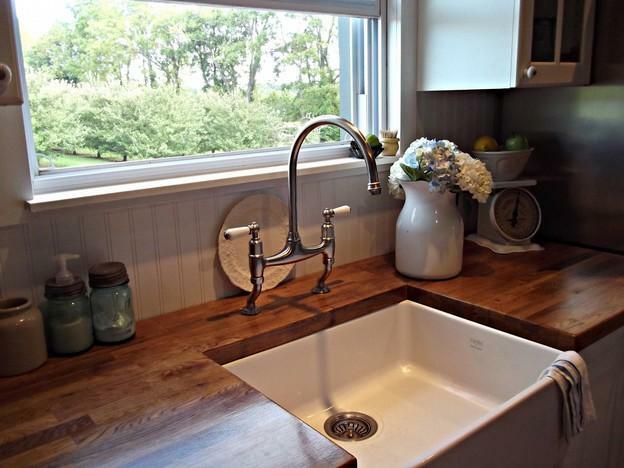 This kitchen faucet is instantly adding a style to the simple white sink. A pretty dish is placed behind in order to make the area looks more decorative. Even though it is made from a stainless steel material, this attractive kitchen faucet blends pretty well with the wooden countertop. 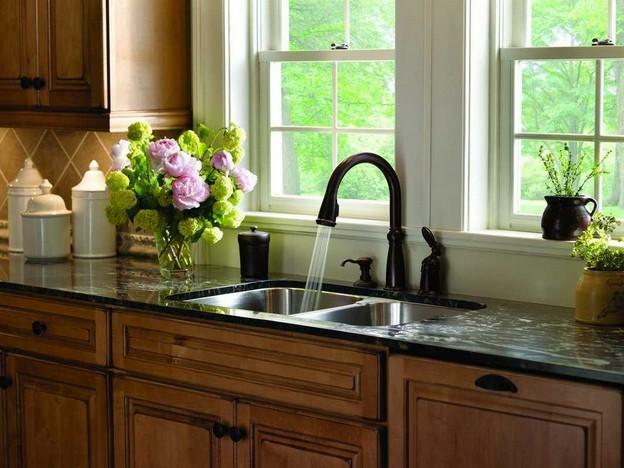 Are you looking for a practical kitchen faucet that is helpful for you to wash the dirty dishes? 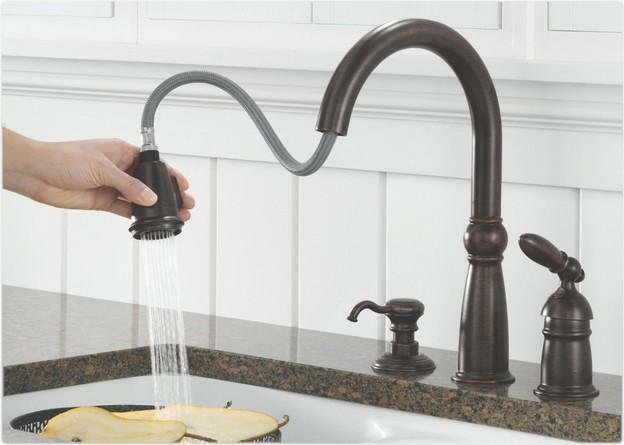 Then, this kind of kitchen faucet is the one for you. This kitchen faucet has a hose that can be pulled so that it is easy for you to pointedly wash a dirt in the plates or it is also able to be used if you want to clean the sink by using the kitchen faucet. This type of kitchen faucet indeed accentuates a practicality. Moreover, the shape and the design is very stylish. It matches perfectly with the dark brown marble countertop. 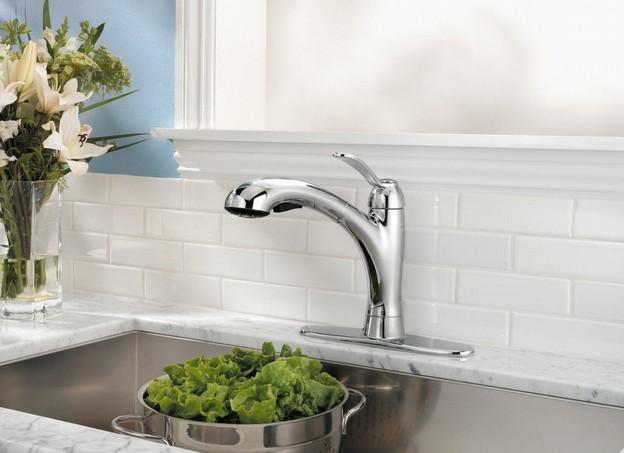 This kitchen faucet is very simple stylish. For you who want to simply make your sink area looks stylish, this kind of kitchen faucet is perfect for you. It matches finely with the pretty and sweet patterned kitchen wall. The stainless steel color of the kitchen faucet is able to add a color in the area beside the light bronze from the patterned kitchen wall and countertop. 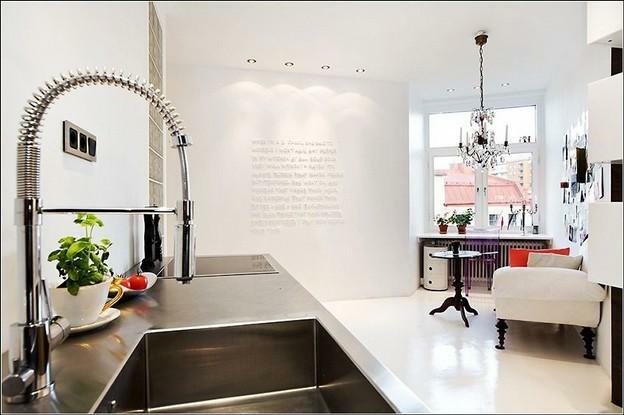 The kitchen faucet in the picture above looks so futuristic because of the design and the material used. This type of kitchen faucet matches perfectly with a concrete kitchen table. There is a button which is able to be used to change the flow of the water. If you want to bring a modern or futuristic style to your kitchen, you can choose this type of kitchen faucet. Do you want a super attractive kitchen faucet? You can pick a golden kitchen faucet just like the image above. 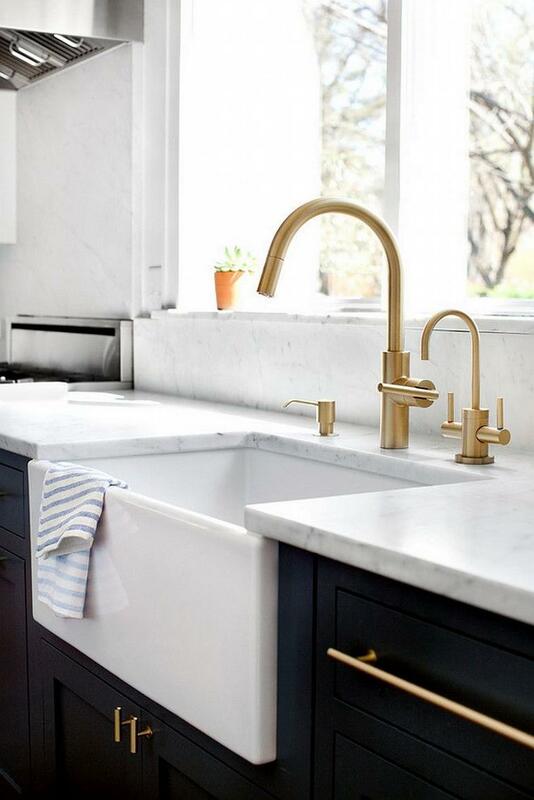 The shape of the kitchen faucet above is already unique, and the gold color makes it even more unique and attractive. 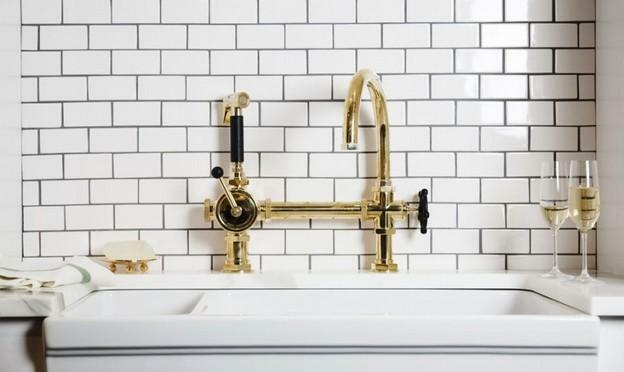 This kind of kitchen faucet is actually more suitable with a fancy marble sink, but the combination of the golden kitchen faucet, simple white sink, and white brick wall in the picture above, is creating a unique look in this area. This idea is a proof that you should not be afraid to experiment with any style of kitchen elements. Having this faucet will make you feel like you are in a five stars hotel. This kind of faucet is more suitable to be used in a fancy bathroom. But you can also use it in your kitchen. You can combine this faucet with a light tone marble countertop just like you can see in the picture above. You are able to choose one made from a stainless steel material, or you can choose one that made from bronze if you want to match it with the light tone marble kitchen table. As you can see, there are a lot of designs and styles of the kitchen faucet. From the fancy ones until the simple ones. You can choose one of the kitchen faucet ideas above in order to make your kitchen and sink even more stylish.